The new bus for Filton has been delivered and details of the route announced. The bus, which will extend across the whole of Filton as well as to Southmead Hospital and Parkway Station, is hoped to start running next month. The timetable will see the 15-seater bus running six times daily, Mon-Fri (not Bank Holidays). The bus has a ramp and facilities for wheelchairs. Prices are to be confirmed but the service will be free for those with bus passes. The service will be run in conjunction with Four Towns & Vale Link Community Transport which runs an on-demand service currently. Funding of £50,000 for the project and purchase of the vehicle was obtained from the Local Sustainable Transport Fund (LSTF) as part of a £600,000 initiative across South Glos. The bus will be of particular benefit in Conygre which has been without a proper service for some time. 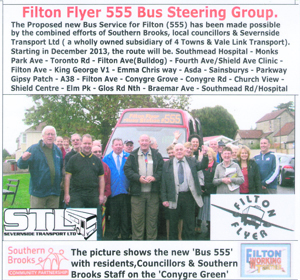 Filton councillor Brian Freeguard, a director and trustee of Four Towns & Vale Link/ Severnside Transport Ltd, said: "I am delighted that all the hard work by the steering group is nearing fruition and I am urging residents of Filton to use this bus to make it a viable service for years to come." A South Glos spokesman said: "A number of schemes promoting sustainable travel in local communities throughout South Gloucestershire were approved for £600,000 of funding through the Local Sustainable Transport Fund (LSTF). The LSTF is a government funded project running across the West of England to increase sustainable travel. The maximum funding that could be applied for was £50,000 for each single project,"